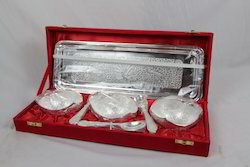 We are a leading Manufacturer of silver plated tray with dry fruit bowls, silver plated 2 glass set, silver plated bowls set with spoon, silver polish tray with 2 bowls, silver plated oval type tray with bowls and silver plated oval shape bowl with spoon from Jaipur, India. 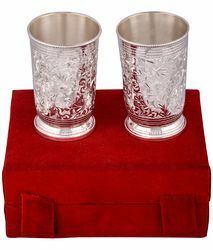 We offer a wide range of Silver Plated 2 Glass Set to our esteemed clients. Offered in different sizes and designs, these glasses are widely appreciated for its quality finish and long lasting impression. We customized our products as per the client’s need. The product range comes in a variety of shapes, colors and sizes and is a treat to the eyes of the lookers. 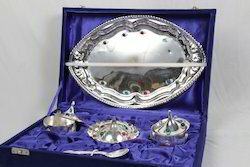 We offer an exciting collection of Silver Polish Tray with 2 Bowls & 2 Spoons, which includes Silver Plated Bowls & Spoons and serves the utility purpose as well as decorative needs of the living area. The range offered by us is available in enticing designs and sizes to meet the requirements of market trends. Furthermore, our collection is perfect fusion of ethnic and contemporary designs. 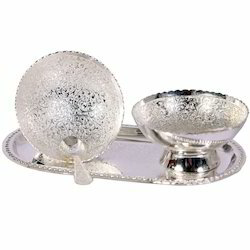 We offer a wide range of Silver Plated Oval Type tray with Bowls to our esteemed clients. Offered in different sizes and designs, these Trays are widely appreciated for its quality finish and long lasting impression. We customized our products as per the client’s need. The product range comes in a variety of shapes, colors and sizes and is a treat to the eyes of the lookers. 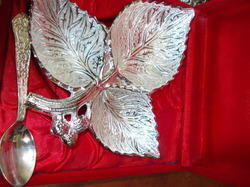 Our esteemed clients can avail from us a superior range of Silver Plated Leaf Bowl at industry leading prices. These are crafted using best grade quality material which is sourced from certified vendors in the market. 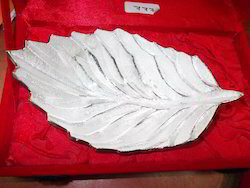 Our range of these products can be used as gifts for various occasions; each leaf is examined to make sure they have a fine shape before being dipped in the gold. We also provide customized solution to our clients as per their requirement. 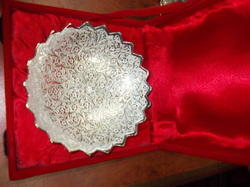 We offer a wide range of Silver Plate Glass to our esteemed clients. Offered in different sizes and designs, this glass is widely appreciated for its quality finish and long lasting impression. We customized our products as per the client’s need. The product range comes in a variety of shapes, colors and sizes and is a treat to the eyes of the lookers. 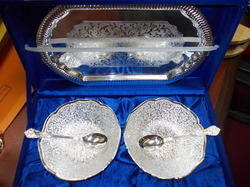 We offer a range of wedding gifts that could be used as Silver Plated Tray with 2 Bowls & 2 Spoons. 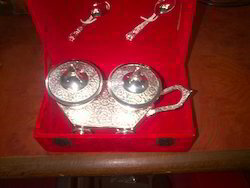 We fabricated these products from high grade raw metals which make these products highly durable. As our products are extremely beautiful in look and adds an extra charm to the interior of our kitchen. We are highly praised for the high finishes and dimensional accuracy of our products. 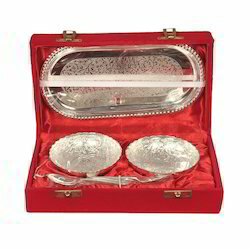 We are the offering a variety of Silver Plated Tray with 3 Bowls & 3 Spoon Set .and very well packed in attractive box to make it a memorable gift item. 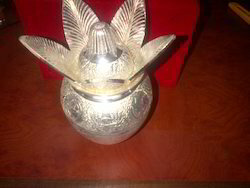 We have a high range of appreciable gift items, with entire satisfaction of all our existing customers. The carving inside the bowl is very much attractive. 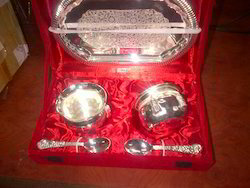 Our esteemed clients can avail from us a superior range of Silver Plated Duck Bowl at industry leading prices. These are crafted using best grade quality material which is sourced from certified vendors in the market. 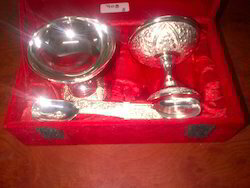 Our range of these products can be used as gifts for various occasions; each Bowl is examined to make sure they have a fine shape before being dipped in the gold. We also provide customized solution to our clients as per their requirement. 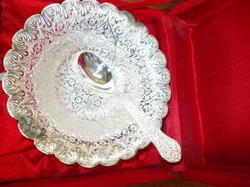 We offer a wide range of Silver Plated Bowl to our esteemed clients. Offered in different sizes and designs, these bowls are widely appreciated for its quality finish and long lasting impression. We customized our products as per the client’s need. The product range comes in a variety of shapes, colors and sizes and is a treat to the eyes of the lookers. 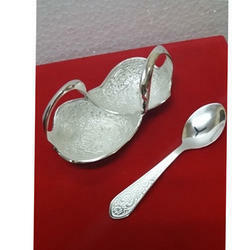 We are one of the leading offering of huge range of Silver Polish Bowl with Spoon. Our product is designed by a team of skilled artisans, using premium quality raw material that is procured from the trusted vendors of the market. 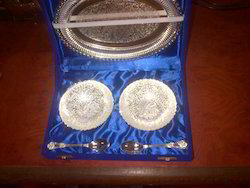 These bowls are of optimal quality and have flawless finish. Our range can be availed in different shapes, designs and sizes. 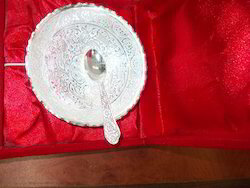 This German Silver Bowl with Stand can be used as decorative or gift item. 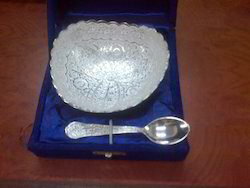 We offer a wide range of Silver Plated Bowl with Spoon to our esteemed clients. Offered in different sizes and designs, these bowls are widely appreciated for its quality finish and long lasting impression. We customized our products as per the client’s need. The product range comes in a variety of shapes, colors and sizes and is a treat to the eyes of the lookers. 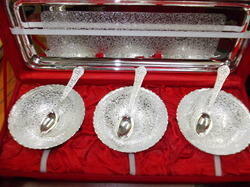 We offer a wide range of Silver Plated Bowl with Spoon Set to our esteemed clients. Offered in different sizes and designs, these bowls are widely appreciated for its quality finish and long lasting impression. We customized our products as per the client’s need. The product range comes in a variety of shapes, colors and sizes and is a treat to the eyes of the lookers. 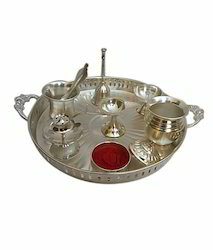 We are engaged in the manufacturing of a unique range of White Metal Silver Meena Tray. Offered range is available to our clients on reasonable prices. Round Wooden Coasters are available in fine quality raw material and are available at reasonable rates. 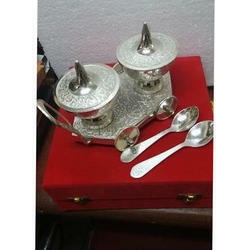 We offer a wide range of Silver Plated Ice Cream Set to our esteemed clients. Offered in different sizes and designs, these bowls are widely appreciated for its quality finish and long lasting impression. We customized our products as per the client’s need. The product range comes in a variety of shapes, colors and sizes and is a treat to the eyes of the lookers. 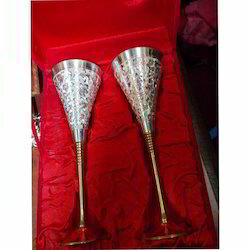 We offer a wide range of wine Glass Set to our esteemed clients. Offered in different sizes and designs, these glasses are widely appreciated for its quality finish and long lasting impression. We customized our products as per the client’s need. The product range comes in a variety of shapes, colors and sizes and is a treat to the eyes of the lookers. 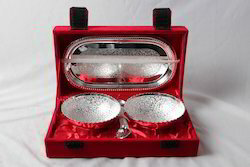 We are the offering a variety of Silver Plated Tray with 4 Bowls & 4 Spoon Set .and very well packed in attractive box to make it a memorable gift item. 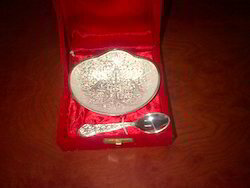 We have a high range of appreciable gift items, with entire satisfaction of all our existing customers. 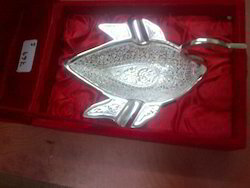 The carving inside the bowl is very much attractive. 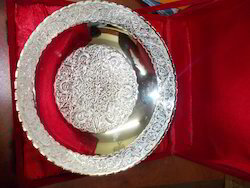 We provide a large variety of Silver Plated Round Plate , which is made in order to suit all kinds of needs and requirements. Our offered range is largely accepted by our clients for its accurate dimensions, attractive designs & patterns. 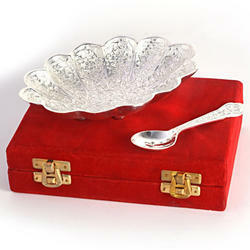 These bowls are embossed with the floral designed base and available in oval shapes. This is appreciated by large number of clients due to high quality and durability. 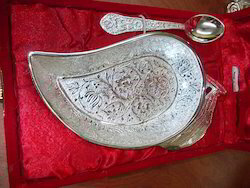 We provide a large variety of Silver Plated Plate with Spoon, which is made in order to suit all kinds of needs and requirements. Our offered range is largely accepted by our clients for its accurate dimensions, attractive designs & patterns. 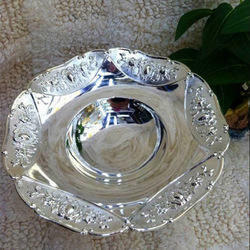 These bowls are embossed with the floral designed base and available in oval shapes. This is appreciated by large number of clients due to high quality and durability. 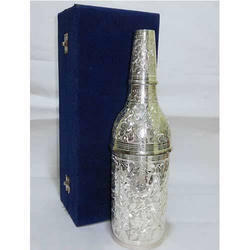 We offer a wide range of Silver plated beer bottle to our esteemed clients. 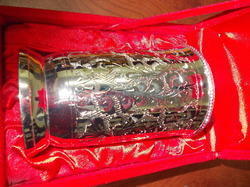 These bottles are beautifully engraved with the figurative designs in golden and silver color. Our range of these bottles are manufactured under the strict control of the industry experts, who keep an eye on all the ongoing production processes to ensure that our range is reliable and free from any defect. 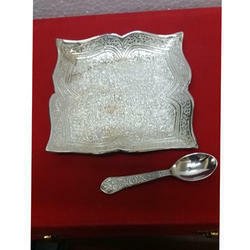 We are offering wide and varied range of Silver Tray with 3 Bowls & 1 Spoon. 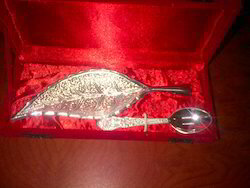 It has mirror shine silver plating. It looks very elegant. Further, we have a huge distribution network which enables us to make our products reach our clients. We offer our range is different sizes and specifications, which can be customized as per the requirement of clients. We provide Gift diaries which are available with traditional religious covers, stone work on cover of diaries, diaries with hand craft work and fancy gift diaries as per the requirement. We are engaged in offering an extensive range of Pine Wood Gemstone Square Tea Coaster. These products are extensively used in bars, hotels and restaurants to cover the glass and as well place the cup or glass on top of them. 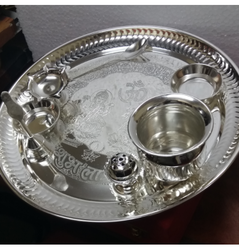 Our Tea Coaster are offered in varied shapes, sizes and designs, as per the diverse requirements of our clients. These Tea Coasters are designed as per the latest trends and standards set by the industry. 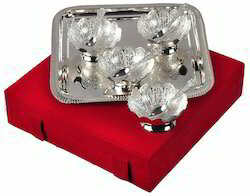 Leveraging on our enriched industry experience, we are engaged in offering a huge gamut of Silver Plated Square Plate. The beauty of this handmade gemstone diary is highly appreciated in the international market segments. This quality assured Handmade Gemstone Diaries are manufactured using superior grade raw materials that are procured form reliable vendors of the industry. 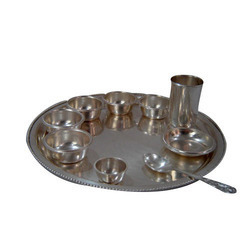 These products Silver Round Thali Sets are well known among our clients due to their fine finish, attractive design, optimum quality and light-weight. Our offered products are used for gifting purpose. 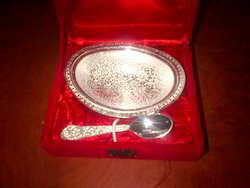 Looking for Silver Plated Items ?